Director Byron Hurt, former star college quarterback, longtime hip-hop fan, and gender violence prevention educator, conceived the documentary as a "loving critique" of a number of disturbing trends in the world of rap music. He pays tribute to hip-hop while challenging the rap music industry to take responsibility for glamorizing destructive, deeply conservative stereotypes of manhood. The documentary features revealing interviews about masculinity and sexism with rappers such as Mos Def, Fat Joe, Chuck D, Jadakiss, and Busta Rhymes, hip-hop mogul Russell Simmons, and cultural commentators such as Michael Eric Dyson and Beverly Guy-Sheftall. Critically acclaimed for its fearless engagement with issues of race, gender violence, and the corporate exploitation of youth culture. Central Islip, NY native Byron Hurt is a filmmaker, gender violence prevention worker, and former star college quarterback. He has a diverse background in the media, with work experience in broadcast television, print, public relations, and long-form documentary. He was a production assistant for Stanley Nelson's American Experience PBS documentary, Marcus Garvey: Look For Me in the Whirlwind and is the producer of the "underground classic" award-winning documentary film, I Am A Man: Black Masculinity in America. Hurt is also the associate director of Mentors in Violence Prevention-Marine Corps (MVP-MC), the first system-wide gender violence prevention program in the history of the United States military. Hurt has lectured and facilitated workshops at colleges and universities nationwide including the University of Kentucky, Southern Oregon University, Washington State University, UMass-Amherst, St. John's University, Loyola Marymount-Los Angeles, University of North Carolina, and the University of Nebraska. Visit his website at www.bhurt.com. 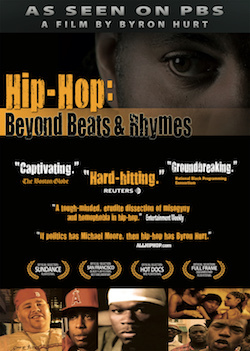 In 2010, MSNBC’s TheGriot.com named Hip-Hop: Beyond Beats and Rhymes one of the Top 10 most important black films of the decade. "I am certain [Hip-Hop: Beyond Beats & Rhymes] will only add to the national and international dialogues around hip-hop culture, and its tremendous effect on our era." "Byron Hurt has a sophisticated and complex framing of the issues and is poised, with Hip-Hop: Beyond Beats and Rhymes to make a critical and long needed intervention on these very important facets of American youth music and culture." "Both honors rap for its courage, as well as holding the producers and creators responsible for disseminating what are often degrading messages." "Hip-Hop: Beyond Beats and Rhymes is a visually interesting and sociologically important examination of the gendered performance of black masculinity in hip-hop culture. ...A fast-paced, theoretically-conscious analysis of the socially significant issues of gender and race identities as performance." "Byron Hurt's documentary is one of the most useful tools I've come across for deconstructing "masculinity, sexism, violence and homophobia in today's hip-hop culture." Instead of taking the traditional route of blaming a vaguely defined and erroneously homogeneous hip-hop culture for women's degradation, Hurt focuses the discussion squarely on the individual men who participate in creating a limited conception of black masculinity that limits both men and women. He does so by featuring interviews with men and women who create and consume in hip-hop in various capacities, and puts the responsibility on men for developing solutions to eradicate violence." "This film poses fundamental questions about how Hip-Hop culture represents and expresses basic attitudes in our society about love, violence, and compassion." "Gives hip-hop an unrelenting, hard stare, questioning its stance on misogyny, hypersexuality, materialism, homophobia, homoeroticism, hypocrisy and the resultant stereotype perpetuation." "A tough-minded, erudite dissection of misogyny and homophobia in hip-hop -- in the tradition of Supersize Me -- this is the one that has people buzzing, 'It should be taught in high schools!'" "Invaluable for understanding not only one aspect of African American culture but how it relates to the rest of American culture as well." "If politics has Michael Moore, then Hip-Hop -- excuse me, commercial rap -- has Byron Hurt. In the same manner that Moore stuck tough questions to the guts of politicians and company executives, Hurt hit up established and aspiring rappers, television and record label executives and even Russell Simmons." "Free-form, first-person docu is an ambitious collage of revealing interviews and pop-culture overviews, employed to illustrate Hurt's meditation on the uglier aspects of hip-hop culture." "A fascinating subject rarely explored in the depth this short documentary submerges in." "Byron Hurt's ground-breaking documentary is the talk of the Hip-Hop circuit and those in the know." "Incisive, informative and entertaining... Though the film bears a viewer discretion warning, it is exactly the kind of program that should be watched by teens who embrace hip-hop music without thinking of the stereotypes it perpetuates and the thug lifestyle it endorses." "A profound analysis and self-criticism by a member of the Hip-Hop Generation." "Filmmaker Byron Hurt takes the hip-hop industry--and audience--to task in his new documentary." "A groundbreaking montage that questions masculinity, homophobia and misogyny in the hip-hop industry for those who live and breathe the culture."